Hello, I would like to enter a picture of My Search and Rescue dog Banjo and I. 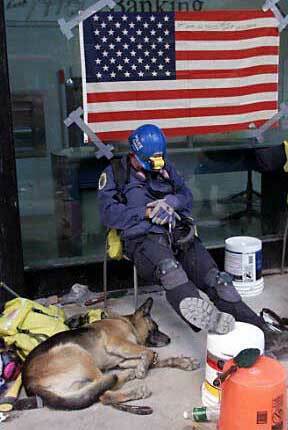 This picture was taken of us in New York while we were working search and rescue operations at the world trade center after the 9/11 attacks. This picture was taken after we had pulled over 12 hours searching the rubble. We worked there for many months. I received Banjo as a gift from a friend in Germany. Banjo was the first of his bloodline to come to America. I trained him myself to do search and rescue, Narcotics detection and explosives detection. He was a gentle giant weighing 140 pounds and loved to get belly rubs and to work. He had rescued numerous lost vacationers and children prior to 9/11 and had a great reputation in the N.C. Mountains where we had lived, to the point that when ever I went to one of the local steak houses under order of the owner he was given the biggest steak they had! A benefit for rescuing his grandson who had wandered off from a campsite. He passed away in 2007 from cancer that the Vet told me was caused more than likely from his work at the WTC after 9/11. He never come upon a stranger and never was too tired to work, especially when it came to finding children. He had proven to many people that a German Shepherd was not just a guard or attack dog but they were also one of the most dedicated and loving dogs in the world. I hope that you will consider him for the honor of being your German Shepherd of the month. Chris, Thank you so much for sharing your great story about your heroic and wonderful Search and Rescue dog Banjo. What a wonderful and sweet picture too. And I can't even begin to express my gratitude for all the wonderful work that you do - and especially for all your help at 9-11. And if you have the opportunity to send us more information about your experiences with Search and Rescue and your German Shepherd we'd love to hear them. And for everyone else, I'd like to take the time to say thanks to all our visitors for reading along with us. If you get the chance, please come back often to see what else is going on in our growing German Shepherd Dog community. BTW, please tell us also exactly what you think about the above story by leaving some interesting comments below.